Shoreline Cottages has interviewed a number of these ‘Whitby folk’ to find out why they love the town so much and how they think it’s changed. 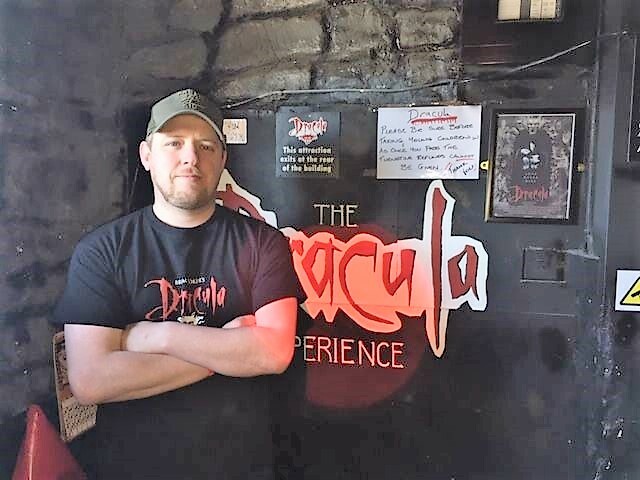 Today we meet Leslie Brown, the Manager of The Dracula Experience, a unique tour through the Dracula story and the connection to Whitby. Using animated scenes, electronic special effects and live actors. I’m the Manager of The Dracula Experience in Whitby. I’ve been here for 19 seasons and enjoy the job. I work with the general public, mainly tourists. The best part of the job is sharing my knowledge about Dracula and seeing the people that get scared inside – this place is like a museum that gives them the full Dracula story. Bram Stoker wrote the Dracula novel. He holidayed in Whitby quite often. A russian boat came ashore and the only thing that survived was a black dog. Bram Stoker saw the black dog come off the boat with his own eyes. The dog then ran up the 199 Abbey steps – this is where the story originated from. We’ve had some celebrities visit, like Catherine Zeta-Jones, Johnny Vegas, David Seaman. I’m lucky to work here – it’s so different. I’m well looked after and I enjoy it. I’m sure the place is haunted – I’ve heard many strange things. Yes. We have been here for 4 or 5 generations. We are from a scaffolding family – my Dad and Grandad were both scaffolders and my Mum is a domestic cleaner. I love the history of Whitby. I wish there were more shops. We have to go to Scarborough to find decent outlets. We definitely need a better parking system here. The Park & Ride doesn’t work for us locals – during peak times it’s absolute chaos! I run a Sunday league football team for adults. I go to a lot of Arsenal matches (I’m a silver member). I think he’ll stay in Whitby, but he’s only 8. He wants to be a police officer. I don’t know. I go on holiday but it’s always nice to get back home to Whitby. People always say how lucky we are to live here.